Sunday 4 December 2011, 3pm-5pm at the Workers’ Educational Association (WEA), 59 Gloucester Street, Christchurch. Sustainable Canterbury monthly facilitated workshop. Tea/coffee and biscuits provided. Venue koha invited. Agenda: election forum debrief / open : ‘population crisis’? – Not. We condensed our research results into an electoral strategy to obtain a public voice for the SCMW issues (watch this space). 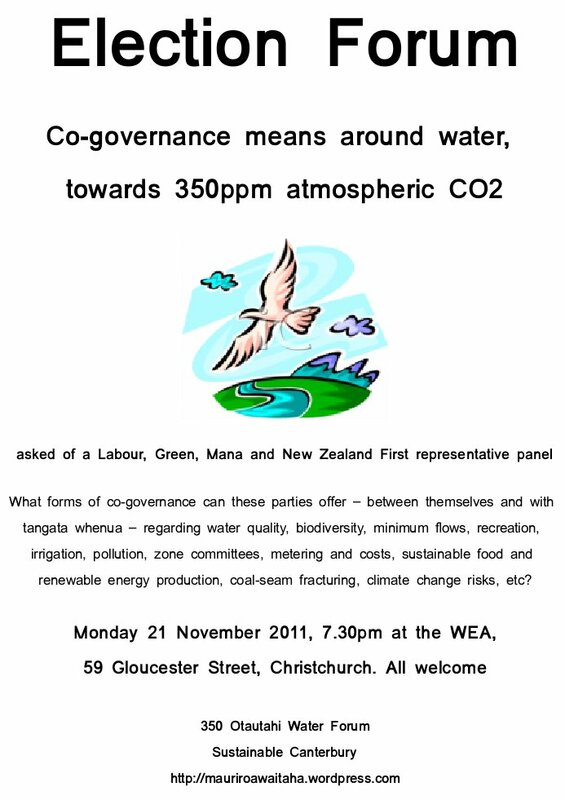 Election year 350 Otautahi Water Forum: Monday 21 November 2011, 7.30pm at the WEA, 59 Gloucester Street, Christchurch. Thank you very much to candidates Jo McLean (Labour), Clinton Dearlove (Mana) and Denis O’Rourke (New Zealand First) for presenting – a most useful discussion entailed. – asked of Labour, Green, Mana and NZ First representative speakers. 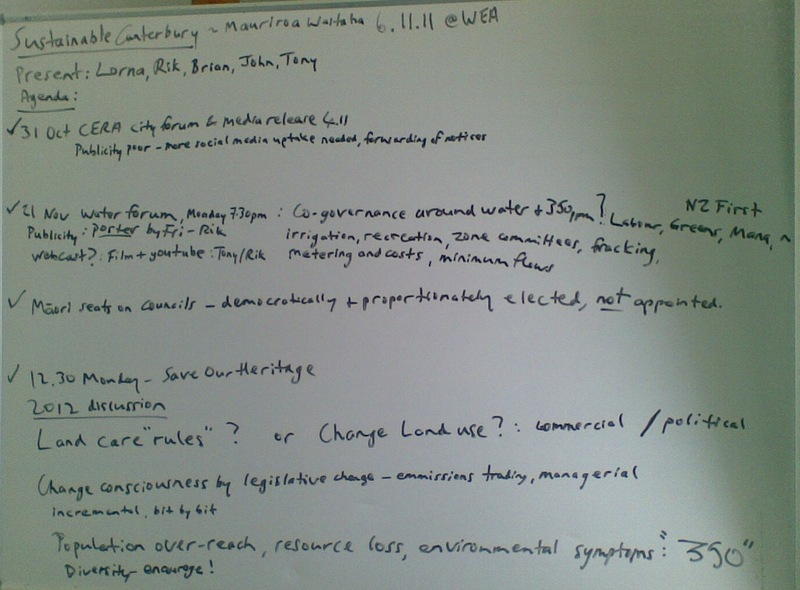 Sub-topics of concern: What forms of co-governance can these parties offer – between themselves and with tangata whenua – regarding water quality, biodiversity, minimum flows, recreation, irrigation, pollution, zone committees, metering and costs, sustainable food and renewable energy production, climate change, coal-seam fracturing (‘fracking’), etc.? Note: Because of their recent implementation of an exclusive regional governance technique in Canterbury, the National, ACT, Maaori and United Future parties have excluded themselves from this current debate. Our apologies are extended for their formal absence here. The forum will be filmed for highlights to later be placed on Youtube. Thank you for your support of local democracy. An election forum tonight looks at the possibility for a change of government and outputs. Local environmental watchdogs Sustainable Canterbury have invited the Labour, Green, Mana and New Zealand First parties to speak on the topic of “co-governance around water, towards 350 parts per million atmospheric carbon dioxide”. Tangata whenua rights, sustainable industry, and greenhouse gas reductions lead the set of related challenges the group want commitments on. Democracy has been curtailed at regional level since April 2010, and a backdrop of damaging earthquakes has further undermined systems for public voice. Sustainable Canterbury were disappointed to see the Christchurch City Council pass over the opportunity to establish a Māori ward seat recently, through its representation review, for example. Water issues have perplexed Cantabrians, with privatisation of supply now in the offing. The Sustainable Canterbury election forum is at 7.30pm, Monday 21 November, at the WEA, 59 Gloucester Street in Christchurch. “‘Co-governance means around water, towards 350 partsper million atmospheric carbon dioxide’ is our forum theme tonight. If the opposition parties can agree on how to achieve that together, people have a very strong reason to vote for them,” Tindall concludes. Note, parallel event: Labour, Green, and National? panel on the fracking issue, at 7pm in lecture theatre C1, University of Canterbury in Ilam, run by the Social Wing of the Anglican Church – contact Nicholas Laing 027-340-8211. Sunday 6 November, 3-5pm at the Workers’ Educational Association (WEA), 59 Gloucester Street, Christchurch; SCMW monthly facilitated workshop meeting. 1. Review of last SCMW public meeting, 31 Oct – need more publicity for better attendances – and our Media Release #4, of 3 November 2011: CERA submitters demand democracy – supported. News: Cera gives Christ Church Cathedral ultimatum The Press 4 Nov 2011 + Notice: heritage protection rally at 12.30pm Monday, outside Harley Building, cnr Worcester Boulevard and Cambridge Tce. 2. Organise public electoral Water Forum, for Monday 21 November 2011, 7.30pm at WEA. Topic: “Co-governance means around water, towards 350ppm atmospheric CO2” – asked of Labour, Green, Mana and NZ First speakers. Sub-topics of concern: irrigation, recreation, zone committees, fracking, metering and costs, minimum flows, etc. Note: Because of their recent implementation of an exclusive regional governance technique in Canterbury, the National, ACT, Maaori and United Future parties have excluded themselves from this current debate. Rik to process invites and make a poster that people can print off and circulate. Use/fwd social media chat too. Tony, John and Rik to resource filming of the forum, for later placement on Youtube. 3. Endorsement of Nelson City Council poised to have Maori ward radionz.co.nz + Council confirms Maori ward Nelson Mail 4 Nov 2011: see our MMP/STV position page notes – carried. Resolved, that: SCMW supports and promotes Maaori political representation (indigenous, Treaty of Waitangi enshrined) that is democratically and proportionately elected, and not executive-appointed. All welcome. Tea/coffee and biscuits provided. Venue koha invited. rehousing affected residents ; the proposed Avon-Otakaro Park and its range of hazards ; protecting versatile soils and the Chch green belt by encouraging settlement south-west ; good public transport infrastructure to guide re-development of Greater Christchurch ; food production and community resilience ; reforestation and its numerous values ; biodiversity ; renewable energy ; CERA Community Forum effectiveness ; etc. 15. Better resilience is needed. Christchurch is poorly prepared to cope with pending pressures from peak oil, peak phosphate and climate change. The city needs to embrace green energy and better design can reduce the need for fossil fuels. 16. The “private sector” of course includes home owners with renters. At the moment a lot of money is coming in to our economy through temporary accommodation insurance, and being passed on, by renters. For many that may last one year. What happens to the economy from then until the rebuild? Need of planning for paying future insurance. To some extent remiums are likely to rise however carefully future building is done, to pay for the past damage. We need to look at what happens in places where insurance is too dear for the average home owner, and plan so quakes – or other environmental damage – have less impact overall. i. Strip Development along existing transport routes. ii. Large, say 0.2 ha, sections, within walking or biking distance of the road/rail. iii. A requirement for households to do biodiversity stewardship, and modern technology decentralised sewerage and energy systems. Managed tree placement would allow shelter from wind and sun, and economise water needs. Recreation/employment/garden food production would be at hand, allowing for some health aspects of the plan. Birds could return where few are at the moment. A house would not cover a great proportion of fertile land. Rural problems like isolation should be minimal. CERA needs to work out the cost impact of replacing the centralised sewerage system. That needs to be done in depth. What is the cost of a centralised algae crude oil from sewage system in terms of production and insurance compared to decentralised. Note that dairy farms may be going that way. Refs: Avon-Otakaro Network AvON “a vision for the Avon River red zone” + The Boulevard? “Maybe we have a name for our new green space by the Avon” CCLblog ; Cooperative Sections “Creating Affordable Sections Through Cooperative Action” ; Wider Earthquake Communities Action Network WeCan! ; Mixed views on Christchurch light rail The Press 06/10/2011 ; Advanced Living “Builders Christchurch – sustainable development within residential construction.. eco-friendly approach – meeting the needs of the present without compromising the ability of future generations to meet their own needs.. toxicity free, energy saving materials and technologies that provide significant performance benefits within all built environments with the cost of these new technologies being directly comparable” ; Trees ‘boost African crop yields and food security’ Environment BBC News 16 October 2011 + Fuel for Africa’s fires ‘wood running out.. charcoal clues to best trees to plant.. Agroforestry is arguably the single most important discipline for the future of sustainable agriculture in Africa’ New Scientist 30 Jul 1987 pp.48-51 + Trees for Africa “answer is to let local people manage natural forests, and to encourage farmers to plant trees in fields and pastures” New Scientist New Scientist 14 May 1987 pp.54-57 ; etc. The Government is using special earthquake powers to redraw greater Christchurch’s urban development area, potentially paving the way for more than 45,000 new houses. Earthquake Recovery Minister Gerry Brownlee said yesterday that he had pulled Christchurch’s urban growth plan out of the Environment Court, where it could have stalled for two years, and put it into the region’s planning documents. A public notice, to appear in newspapers on Monday, will make the change official, rezoning large areas of previously rural land earmarked for development by 2041. Brownlee said land already identified for growth in plan change one to the Canterbury Regional Policy Statement was needed now. He was unwilling to see the matter bogged down in a protracted Environment Court battle. He said that once district plan changes and consents had been obtained, and seismic tests carried out, the rezoned land could be developed to accommodate thousands of people displaced by the quakes. It includes areas in Christchurch on which 25,000 houses could be built, as well as about 11,000 houses each in the Selwyn and Waimakariri districts. The new chapter of the regional policy statement also makes provision for businesses. Brownlee said the changes would require more intensive use of land within existing urban areas and provide for greenfield developments. “They will accommodate both the population relocation forced by the earthquakes and population growth as the pace of rebuilding and development quickens,” Brownlee said. Since February’s massive earthquake, the Government has red-zoned more than 6000 properties in Christchurch and Waimakariri, meaning the land is too damaged to be built on without being remediated and will have to be abandoned. Concerns have been raised by the owners of the damaged land, as well as Opposition politicians, about the dearth of sections available in and around the city and the premium prices demanded for sections and houses in undamaged suburbs. The Government’s announcement is good news for developers who have land within the urban development boundaries. Environment Canterbury had already asked the Environment Court to redraw its housing development lines to include areas such as the 2700-section Prestons project and other peripheral sites. Prestons Road chairman David Schwartfeger, who is also Ngai Tahu Property’s development manager, said a plan-change decision on the subdivision was imminent and the Government’s move was a positive step. “We’re keen to get going and put people back into homes,” he said. Redrawing the boundaries was supported by the Christchurch, Selwyn and Waimakariri councils, ECan and some developers. However, other landowners who went to court to have their land included within the urban growth limits are unhappy. Russell McVeagh partner James Gardner-Hopkins said his client, supermarket giant Progressive, which owns land at Marshland, was reflecting on the implications of the decision. Disgruntled developers might push to have their land rezoned when the Canterbury Earthquake Recovery Authority considers the city’s infrastructure recovery plan. The Selwyn District Council said a plan change had been approved to rezone 822 hectares in Rolleston and Lincoln on which almost 9000 residential sections could be created. Sunday 16 October, 3-5pm @ WEA. Present: Lorna, Tony, Brian, Ian, Rik. Apologies: none. 1. CCC, RPS and CERA submission process inputs. 2. Setting our next forum topic and date, etc. 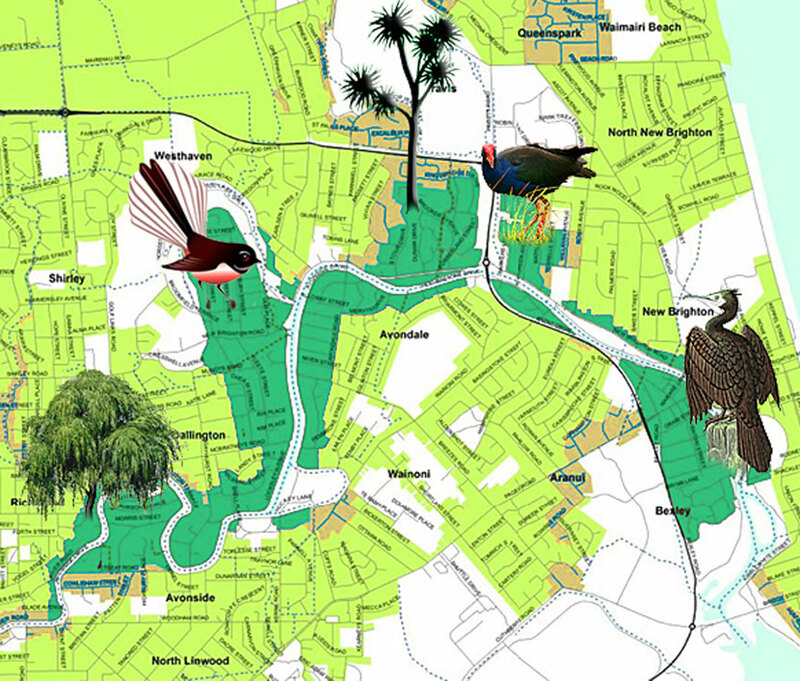 rehousing for affected residents ; the proposed Avon-Otakaro Park and the range of nearby hazards ; protecting versatile soils and the Chch green belt by encouraging settlement south-west ; good public transport infrastructure to guide re-development of Greater Christchurch ; food production and community resilience ; reforestation and its numerous values ; biodiversity ; CERA Recovery Strategy submissions due by 30 Oct ; CERA Community Forum effectiveness ; etc. Refs: Avon-Otakaro Network AvON ; Cooperative Sections “Creating Affordable Sections Through Cooperative Action” ; Mixed views on Christchurch light rail The Press 06/10/2011 ; etc. 1. Regarding the particular rail focus for the Greater Christchurch rebuild, Sustainable Canterbury stands with the vast majority of citizen submitters who seek to “change the draft Plan!” – by promoting immediate development of a commuter rail system from Rangiora, Kaiapoi, Rolleston and Lyttelton, with dual-line and station expansion as the top priorities for what will be spent on rail, enhancing the existing rail corridor and its use. Carriage design must accomodate the numerous bicycles, prams, wheelchairs and scooters? etc that are needed in the city centre to help realise: a. efficient movement in the uncluttered “slow core” of the new central city plan; and b. economic recovery, etc. by custom (e.g. easy health service access from outside Christchurch). 2. Transport mode-change hubs / stations are needed with decision ‘1’, to connect with buses and any new passenger light rail infrastructure (that should be further consulted on). Obvious hub locations might be Papanui, Addington, Hornby, Woolston, and Moorhouse Ave (latter as proposed by the NZ Institute of Architects). 3. A full feasibility study of what the best integrated public transport system would thereafter be for Christchurch – following expenditures ‘1’ and ‘2’ – needs to take place, as budgeted in the draft Plan. A main outcome from this study should be practical means for balancing public transport infrastructure development equally across all of Christchurch city, east to west and north to south. The need is actually greatest in the east, which must be prioritised for efficient transport solutions. 4. Should light rail emerge from that study – where all other options have been equally considered – the route we are favouring so far is not the overly-expensive CBD-Ilam line in the draft Plan, but that researched by Richard Worrall (yet with modification) using diesel+electric engines, heading off from the main northern rail line at Papanui, to travel Papanui Road past St Georges Hospital, Merivale, Victoria Street, Town Hall / Convention Centre, CBD slow core, Christchurch Hospital and Hagley Park, to Addington station hub and southwards. The Addington-to-city-centre leg of this efficient commuter rail plan is probably the appropriate line to start with. But commuter light rail may yet be excluded from Christchurch city – in favour of more economical technologies – depending on what comes out of proper study under expenditure ‘3’. 5. An inexpensive private motorcar ride-sharing IT support system to be implemented ASAP, such as Avego “Real-Time Ridesharing” in Kinsale & Dublin, Ireland, Washington & San Jose, USA, & Dalian, P. R. China, or GetThere.ie “Bus, Rail & Carsharing in Ireland” e.g. 6. Support for cycle and walk way plans in the draft, but adding enough off-street car-parking and fast bus-routes to secure the public transport corridors for the future; that is, support for the prior transport planning done under ECan aegis. 7. There does need to be some rapid transit between CBD, Riccarton (including Riccarton Bush), University of Canterbury and Lincoln. If the city is to develop its knowledge and cultural quotient, there must be stronger connections between the places of learning, business, music, art, museums and natural environment. This will be important if the universities are to be internationally regarded and attractive places for students to come to. And around these are the CRIs and Polytechs which together provide a lot of the intellectual grunt in the city and must be strengthened if a vibrant, knowledge-based city is to develop and prosper. Fast bus-routes for improved use of existing bus services should be created initially, and we must resolve any further inefficiencies around this. Universities are potentially the power house of innovation and social/cultural stimulus. The city needs to embrace its centres of higher learning and a strong physical/transport link of some sort should be part of the plan. This applies to both Canterbury and Lincoln. Retreat from the present CBD to somewhere west, over the next century or so, depends, as with Rolleston previously, on a land bank purchased by govt to remove it from the speculators’ grasp. Along with embracing the universities and CRIs a very strong demand needs to be registered with government that if CRIs are to be amalgamated, that the Christchurch region must not lose any more head offices, as happened recently with merger of Crop and Food with Hort Research (HO went to Auckland). If govt really believes in retaining critical mass, career paths and investment in the south, then this needs to be embedded in CERA/govt policy. Indeed more govt agencies should be relocated to the south to balance the never-ending and growing subsidies to northern centres. Govt supported TV production, from which derives other film industry activity, should be re-established in the south. There needs to be a challenge to the notion that all our eggs should be directed to the auckland basket as THE international city of nz. This has never been accepted/adopted by the rest of nz. Auckland has enough momentum to determine and pay for its own destiny. The “super south” needs a fair redistribution of long term investment/commitment, not a short term hand-out, however large that might be. Our destiny is linked to rest of South Island and we should be pulling together in this – reconnecting passenger train services and supporting Invercargill and Dunedin as much as Canterbury – moving the centre of gravity south. 8. Preserve some of the ruins. Obsessive tidying of the city is further destruction of our heritage – which has now a new (EQ) layer. This is all to do with sustainability – having a vision for the future that stands on its history in some tangible way; retaining novelty, flair and boldness so we stand out from other places. If people support this submission format, please speak up; or if you’d like it changed or added to at all – same. If there is major contention with this broad proposal – which opens up the range of public transport options for better attention – we will need to meet at WEA, 59 Gloucester Street, at 3pm on Sunday 2 October, to sort the matters out. C. + late addition idea SkyCabs “Elevated Small Group Automated Rapid Transport (ESGART).. An Alternative Transport Strategy to dramatically reduce congestion and to save Auckland the $2 billion cost of congestion each year”. Presentation – Light rail transport options for Christchurch – by Richard Worrall. All welcome. More details on meeting page. A transport plan for a rebuilt central Christchurch has “considerable risks” and should not be approved without wider consultation, Environment Canterbury (ECan) says. At this week’s draft central-city plan hearings, ECan chief commissioner Dame Margaret Bazley told city councillors there were “considerable risks” in the transport proposal laid out in the plan. Changing the single transport hub system to one with multiple stations was a “substantial call” that needed careful consideration, she said. “Journey times, reliability and simplicity are all factors that are fundamental to the use of public transport to, from and through the central city,” she said. She said proposed street closures and changes from one-way to two-way streets could have a negative impact on public transport. The final transport plan should account for the significant residential growth predicted for the Hurunui, Waimakariri and Selwyn districts, she said. ECan supported the city council’s proposed investigation into a light-rail network, but it needed to ensure the links would attract enough passengers to cover costs. Bazley said the council should also consider establishing other public transport corridors throughout the city to cater for future demand. A final decision on the city’s transport plan needed to be made in consultation with ECan, the Selwyn and Waimakariri district councils and the Canterbury Earthquake Recovery Authority, she said.